Morning! I hope you all had a fab weekend. Yesterday I found this great idea for a wreath and knew I just had to share it with you all. Stripy straws are the perfect party styling accessory currently but I am sure you will agree that this wreath made using stripy straws is very cool. I think it would look great hung above a dessert or sweetie table or even on a door. 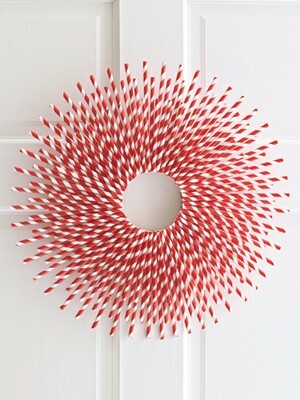 Perhaps you can make smaller ones and string them together to make a unique wreath? Or try making using a rainbow of colours or in a pastel shade for a baby shower. I love diy projects with endless possibilities and think this stripy straw wreath may just be one of those projects!